A joint at the base of an angled member that is designed to stop it sliding. 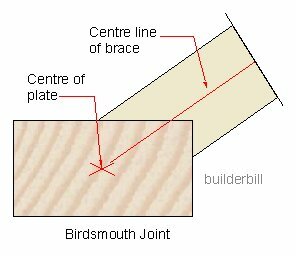 Best known in roofing as the joint between rafter and wall plates the humble birdsmouth joint is used a lot for permanent propping of under purlins in roofs and for temporary propping in formwork and shoring work. The sketch above shows the centre lines of the two members lining up, and this works in most cases. It is a good rule of thumb that makes sure that the small lip is never so small that it can split off under load and let the prop slide. Usually fixed with nails in temporary work.